I came to this book because it is about the complex relationship between books and readers, sttrytellers and listeners, secrets and lies. The set-up is promising: a young, single woman works with her father in an antiquarian bookshop. Unexpectedly, she receives a letter from the most popular writer of all time. It is said that "Vida Winter's" sales are higher than that of the Bible, but God doesn't really keep track of the inventory. One of Vida Winter's books is known as "The Thirteen Tales," but has only twelve short stories inside. Every interview she has given has a different story of her life, and the mystery that is Vida Winter has become one of the great conundrums of this fictional literary world. Now,the narrator has been invited to hear the true story of Ms. Winter's life. 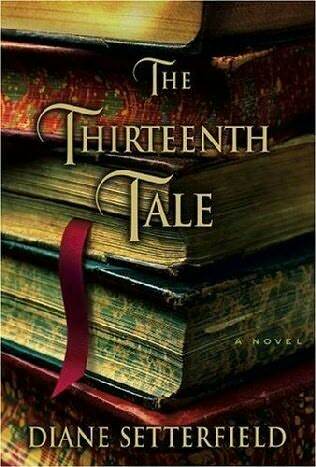 This would be the missing "Thirteenth Tale." The tale unfolds in a damp Yorkshire house in winter. Vida Winter comes from a family of excessive emotions: her grandfather locked himself in the library for months after the death of his beloved wife; his two children had a sado-masochistic incestuous relationship of some unhealthy variation; when the daughter Isabelle was sent to a insane asylum her brother Charles lived like a beast one wing of the house and he killed himself upon hearing of her death. Before she died, this daughter had eloped, bore twins, then returned to her childhood home a widow. These twin girls are "Vida Winter" and her sister, who have some sort of secret twin relationship that is distinctly disconcerting. The story plows on through foundling babies left on doorsteps, mysterious fires, rot and decay, adulterous affairs, ghosts and other metaphysical trappings. And I'm only just halfway through it. If this had been written by an American, it would immediately have been dismissed as "Southern Gothic," and a feeble pastiche of Flannery O'Connor and William Faulkner. As half the book takes place in Yorkshire, I can't help but think of Wuthering Heights. The quasi-incestuous connection between the first Cathy and Heathcliff is echoed in the opaque relationship between Isabelle and her brother Charles. "Isabelle" is even a character's name in Wuthering Heights. The contrast between Wuthering Heights and The Grange is mirrored in the decay of "Angelfield" that is briefly reversed during the tenure of a governess. For a several months, cleanliness and order are imposed, lasting only until the governess abruptly leaves. The book lacks the precise grounding of Wuthering Heights, the studied detail that made the operatic passions of those characters so unsettling. The Thirteenth Tale, thus far, seems to operate in a mist. There is no way to tell when this story takes place: no one uses the telephone, all communication occurs through letters. Transportation is by train and occasionally wagon, most often walking. The narrator transcribes her notes on reams of paper with pencil. There are no clacking typewriters, or humming laptops. No cars or airplanes or evidence of world events. Should I imagine the narrator striding through the story in the hobbled skirts of the late Victorian Age? Thus far the book does not definitively answer this question. With that fundamental vagueness unresolved, it's hard to respond viscerally to the book's attempts at hauntings. Every day seems to be rainy and dark, every garden has no obvious layout, every house has unopened door, unasnwered questions, children who are abandoned. The unrelenting "ooky spooky"-ness of it undermines the books attempt to evoke curiosity about how the dead relate to the living, and how the living might as well be dead. It all takes place in an insubstantial dream world, and so the consequences feel just as vaporous as the morning residue of dreaming. I'm going to keep going, but it is feeling like it's gearing up to some sort of Gothic revelation and surprise twist. 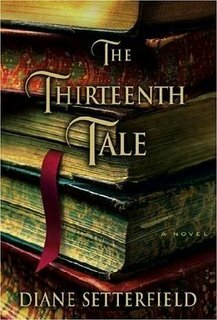 We've grown disenchanted with M. Night Shymalan's twisty movies, and I'm expecting to be equally unmoved by the resolution of the Thirteenth Tale.